Today, we have Claudia and Ralph on Nell magic . We hooked up with a big tuna. Ralph does a nice fight on the chair but no luck pull the hook just 10 meters line out. 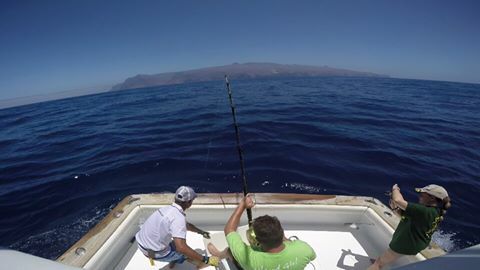 Just after, we hooked up with a blue re bad luck, pull the hook just before to start the fight on the chair. The 2 fish eat the Bonze Violator on the short. Tomorrow another good day in La Gomera.